Rock Imager 2.10 is a major point release that introduces organizational interface changes, additions to the Plate Configuration page (now called the Plate Type Editor), several enhancements to both the SONICC and FRAP imaging processes, and more. Keep reading to learn about each of the changes. New Imager Menu. Various options from the Imager menu have been consolidated into the new Image sub-menu, as shown in the screenshot below. Added the ability to image Interesting Drops. Once you’re running Rock Maker 2.8, you will have the ability to tag certain drops as interesting using the “i” key while viewing images in Rock Maker. You can then choose to image only interesting drops from the Rock Imager software, saving time and image disk space. New Columns on the Scheduling Tab. If you have a dual imager Rock Imager 1000, the Scheduling tab will display two additional columns: Imaging Modes and Completed Imaging. The Imaging Modes column shows imaging methods that were scheduled for an imaging session, and the Completed Imaging column shows imaging methods that were successfully completed. If you are running an automatic imaging session using two imagers, the Imaging Modes column will display the imagers separately. Improved plate search. We have removed the need to search using “wildcards” – you can now simply type in your search parameters in the appropriate field and press the Enter key to search. Easily identify plates that are stationed at an imager. If a plate is currently stationed at the imager, it will appear as highlighted in yellow on any Plates sub-tab (Scheduling, Search, Load Port). Further, we’ve added mouseover explanatory text that explains why a certain plate is highlighted, as shown below. This feature is available for all Rock Imagers except for Rock Imager 2 and Benchtop versions of SONICC and FRAP. Plate Configuration renamed Plate Type Editor. Read more about the Plate Type Editor. New Standard Drop Locator field. The Standard Drop Locator field allows you to specify settings related to the number of pixels that should be included in a drop, the aspect ratio, and more. New Export button. You can now click an Export button to capture your plate settings and save them as an *.xml file. You can then edit the plate definition file in a text editor, rename it, save it, and import it as a new plate definition file using the Browse button next to the Plate Definition field. Enhanced Drop Tuning for SONICC users. The Plate Type Editor has been modified to include a Capture Tuned Drops button, so you can define drop positions with the visible imager, overlay the visible image from each drop position on top of the SONICC live image, and use them as a tuning reference (Dual Imager SONICC only). Editable Drop Position Coordinates. The X, Y, and Z fields in the Drop Position area are now editable, which means you can input exact drop positions instead of having to use the manual well and drop controls to define drop locations. New Laser Camera Control. 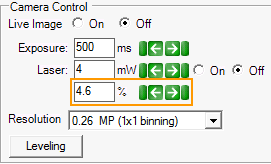 A new field has been added to the Camera Control panel allowing you to amplify or reduce the power of the laser at will, expressed as a percentage of maximum power. Read more about camera controls. Laser automatically turns off when idle. To prevent thermal decomposition to samples, the SONICC laser will now automatically turn off after a specified idle period during manual inspections. SONICC arm automatically retracts upon software shutdown. If you exit the Rock Imager software, SONICC will retract its arm to ensure that the plate door is closed when not in use. FRAP Configuration menu improvements. 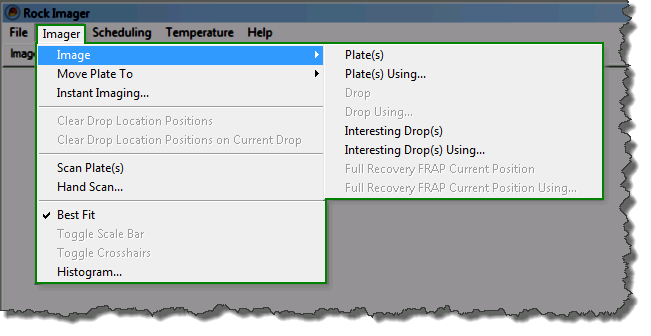 The FRAP Configurations dialog box has been simplified to make setting bleach options, full recovery and high throughput imaging options, and curve-fitting options easier. Improved FRAP Capture Profiles. Additional Capture Profile settings are available in Rock Maker 2.8, granting you more control over your imaging sessions from the Rock Maker side. Improved curve fitting algorithm. FRAP curves are now generated more accurately based on improvements to the curve algorithm. Ability to use both Center and Edge bleach spots. You can now choose to select both a Center and an Edge bleach spot when imaging drops. Improved setting of Bleach Position Locator. 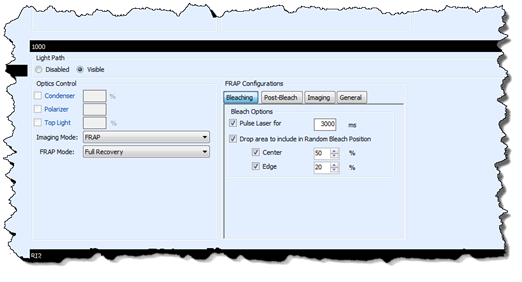 You can adjust specific drop intensity threshold value toward the bleach spots in the FRAP configuration.